This was the funeral of Kenneth Macfarlane. At the front are Dannie Fraser, John Ferguson and John Gilles. 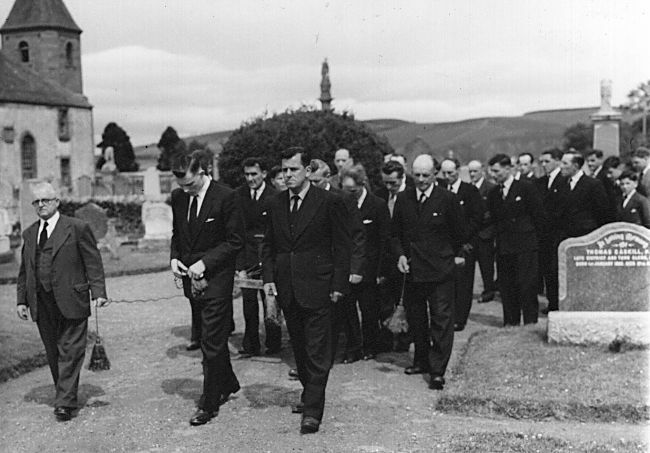 Quite a few faces there ...looks like Alla Macdonald directly behind John Gillies .. then Abu Shepherd, to left of " Evan the Post" and far Right ..over Gravestone ..looks like a young Harry Kynarzyk? ..Albert Larne to left of Him and D Maclennan ? Donnie Robertson is behind John Ferguson. I remember him telling us about the football match the night before Kenny died, and how he had complained to him during the game of feeling unwell. I have never seen this picture before. That looks like Douglas Macphee just behind him and is that Ronnie Winton at the back? A few more names from my father starting from the far right behind the gravestone; Gordon Hogg in front of him Ronnie Hendry, Robert Patience?, Albert Larne, Albert Ross? in front of him Tommy Maclean. Is that a young Harry Kynarzack ...far right near grave stone? Or is it Donald Hossack? Yes it is me, a young Harry Kniarzyk beside the gravestone. Yes uncle Harry ya looked better in those days - what happened to ya?